With the new school year and sports programs well underway, it’s a good time to discuss student safety through the implementation of a cardiac emergency response plan (CERP). 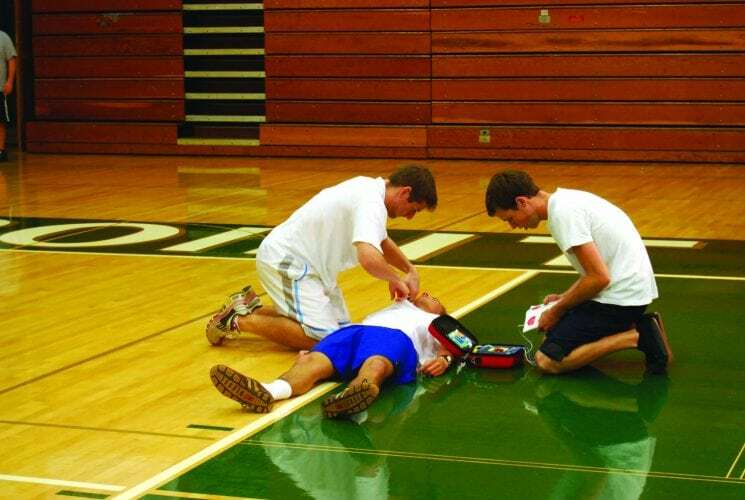 Sudden cardiac arrest (SCA) is the leading cause of death on school campuses as well as the number one killer of student athletes, which is why having a written and well-practiced emergency response plan is so important. Your commitment to protect young hearts could save a life. During an emergency, it’s common for people to freeze and not know what to do, especially if a situation is unfolding quickly. Designating certain team members, especially those already trained in CPR and AED use, as part of the CER team can help alleviate some of that confusion should an emergency arise, while also maintaining control of an unpredictable situation. Once you’ve identified the members of your Cardiac Emergency Response Team, document the protocol that team is to follow in the event of a cardiac emergency. Write down clear steps for the bystander witnessing the event, how the CER team is notified and what happens school wide during the emergency. Be as specific as possible. Using an automated external defibrillator as soon as possible is the factor which most affects survival, since it’s the only way to restart a heart. Because average arrival times for EMS are eight to 12 minutes, deploying an onsite AED could mean the difference between life and death. AEDs are designed for anyone to use, so you cannot hurt a person by using an AED. Most importantly, AEDs should be accessible—not locked away in a desk, closet or office and periodically maintained to ensure they’re ready. Practice makes perfect. The old adage rings true. The best way to deal with an accident or emergency is to prepare for it. Given lives lost to on-campus fires is a fraction of those lost to sudden cardiac arrest, scheduling at least one cardiac emergency response drill annually to test your plan assures everyone is apprised of the latest emergency protocols. Once your Cardiac Emergency Response Plan is complete and well-documented, share the plan across campus. The single, most important message is that anyone can save a life. It’s a studied fact that when bystanders promptly respond to a cardiac emergency, survival rates increase. Equipping your school community with the knowledge and tools will create a culture of prevention and empower the next generation of life savers. For more detailed information about what to include in your Cardiac Emergency Response Plan, visit our CERP page, where you will find useful resources as well as a CERP Toolkit available for download.